Is there a better alternative to Luminous? Is Luminous really the best app in Network category? 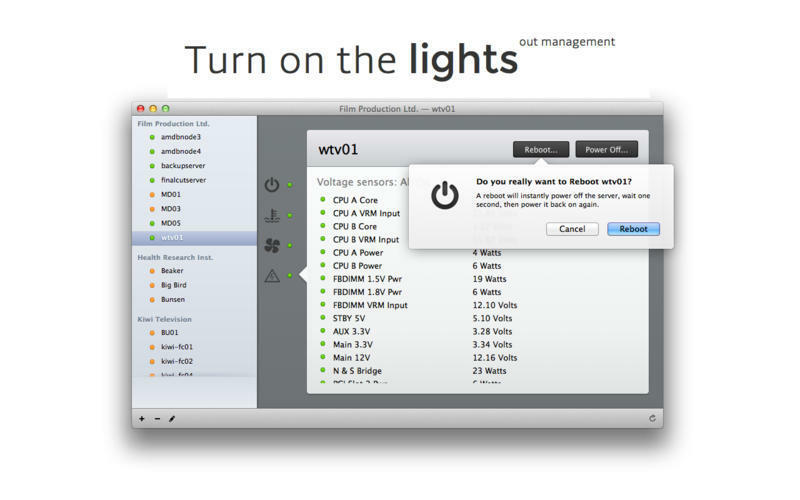 Will Luminous work good on macOS 10.13.4? Luminous is a server management utility that allows for organization and monitoring of IPMI-enabled servers, including the Xserve. Sensors can be monitored and servers can be restarted within the app, and has been optimised to function over slow network connections. Passwords are securely stored within the user's Keychain. Luminous replaces many of the features Apple once offered in its Server Monitor tool. The app supports the Intel-based Xserve line-up, and additionally adds compatibility for most IPMI-equipped enterprise servers. Luminous needs a review. Be the first to review this app and get the discussion started! Luminous needs a rating. Be the first to rate this app and get the discussion started!